There are many breeds of Spaniels in the world, some of which are included in the Sporting Dog group of the American Kennel Club (AKC). The Spaniel dog breed is the oldest dog breed in the world and has an ancient Spanish origin. And the first Spaniel documented to arrive in North America was aboard the Mayflower in 1620. A more specific Spaniel breed is he Cocker Spaniel. There are two Cocker Spaniel dog breeds in the AKC. One is the American Cocker Spaniel dog breed and the other is the English Cocker Spaniel dog breed. At one point, both these Cocker Spaniel dog breeds were considered the same breed. But the AKC separated them as two breeds in 1935. There are many similarities in the breeds, but the biggest difference is in their size. Cocker Spaniels were originally bred to hunt the woodcock – hense the name “Cocker” Spaniel. However, Americans preferred to use them to hunt quail. So a smaller version of the English Cocker Spaniel dog breed was bred and the American version took hold. Cocker Spaniel dog breeds are one of the most popular dogs in the United States. Not only are they great game dogs with their ability to both flush birds and retrieve them, but they are also great family house dogs. They are great dogs to have with every member of the family, including children and even with other pets. However, you will want to make sure that you either adopt an adult Cocker Spaniel whose temperament has already been gauged, or purchase a puppy from a reputable and responsible breeder. The popularity of the Cocker Spaniel dog breed has resulted in a number of irresponsible breeders to breed several undesirable temperament traits such as separation anxiety, excessive barking habits, aggression, and other such unstable temperaments. A reputable breeder breeds only the Cocker Spaniel dog breed and only breeds them for the love of the breed, not just to make money. A reputable breeder may also be a member of the American Spaniel Club. http://www.asc-cockerspaniel.org/. Cocker Spaniels are both very affectionate and playful dogs. They are relatively easy to train, but can be very sensitive to harsh training. Some are overly submissive so careful positively reinforced training is needed to build their confidence. The Cocker Spaniel dog breed is energetic, outgoing, and playful. They need a moderate daily walk and fun games like fetch. With their intelligence, energy level, and eager-to-please nature, they would also do well with agility training. The Cocker Spaniel dog breed is the smallest of the Spaniel dog breeds. They have somewhat short legs and a long and straight back. The Cocker Spaniel weighs between 24 and 32 pounds and stands 13.5 to 15.5 inches tall. They are easily recognized by their docked tail, rounded skull, and long lobular ears. They have a flat wavy coat which needs regular grooming. Brush two the three times a week and pay close attention to the ears. The Cocker Spaniel dog breed is prone to having ear infections and other ear problems. If keeping the coat of the Cocker Spaniel long, more regular brushing may be needed. Otherwise, have the Cocker Spaniel’s coat clipped every two to three months. The colors of the Cocker Spaniel dog breed is many. The three main color groups recognized by the AKC include black, ASCOB (Any Solid Color Other than Black), and parti-colors. A Cocker Spaniel who is considered black in color may be a solid black or black with tan markings. ASCOB colors include brown, red, cream or buff, or silver. ASCOB colors can also have tan markings. Parti-colors of the Cocker Spaniel dog breed is any solid color with a white background. This includes black and white, black with tan markings plus white, brown and white, and red and white. It also includes roan. Roan is a solid color intermingled with white hairs. Colors of the Cocker Spaniel dog breed not favored by the AKC include sable and merle. Merle is a mixture of two solid colors (not including white) which are in sort of a dappled or swirled pattern. A merle-colored Cocker Spaniel may have blue eyes. It is a dangerous color to breed because if two merle Cocker Spaniels are bred, puppies can be born blind and deaf and have a number of other health issues which may shorten their lives. So while the Cocker Spaniel dog breed can be the perfect family pet or hunting dog, careful research of the breeder is needed before purchasing one. Visit lots of websites for more information and don’t rely on the information on a breeder’s website alone. Or if you adopt an adult Cocker Spaniel, be sure to ask the rescue group or shelter as many questions about the dog’s health and temperament as you can. 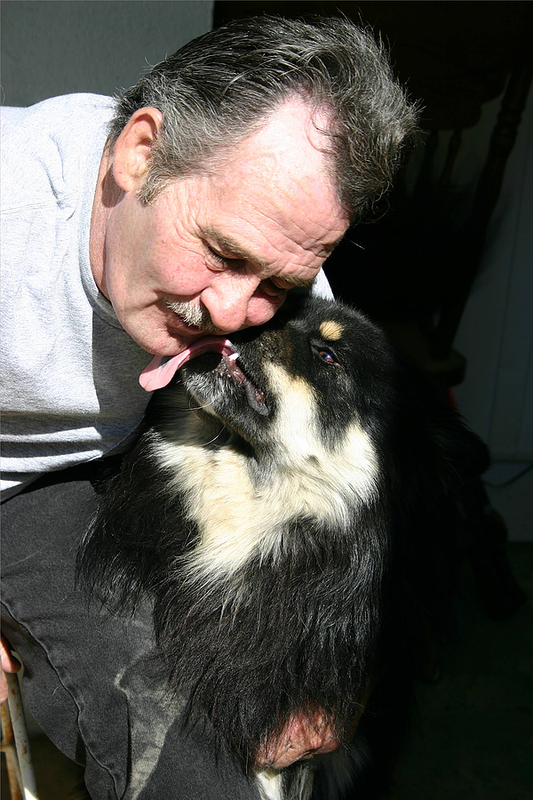 Make sure every family member has a chance to meet and interact with the dog before taking him home. “The Dog Breed Bible” by D. Caroline Coile, Ph.D.
A figurine of the Cocker Spaniel is pictured above. This Cocker Spaniel figurine can be found at the AnimalFigurineStore.com. New to the Animal Figurine Store.com are your favorite dog breed figurines in a devil costume. We love our dogs but sometimes they have quirky little annoying traits, or sometimes they do some naughty things. That is where the Devil Dog Breed Figurines come in. Take my dog, Maya, for example. She is basically a good dog. But there was this one time when we went to the dog park and the first thing she did was find a big muddy puddle and jump in it. Its what dogs do so I couldn’t be mad at her, but I couldn’t help thinking, “You little devil!” At that moment, the Labrador Retriever Devil Dog Breed Figurine was a perfect representation of her. There was another time when we went to a park which had a big fountain. The water of the fountain was dyed pink for Breast Cancer Awareness week. Maya, being a Labrador Retriever and all, saw the water and bolted so quickly that I lost hold of her leash. Next thing you know, she is playing in pink water. Since Maya is a Yellow Labrador Retriever, she turned pink for a week. 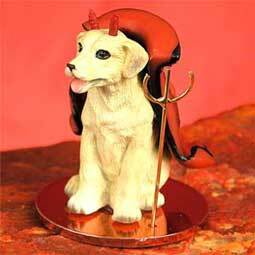 It was really funny but I couldn’t help thinking, “You cute little devil!” Once again, the Labrador Retriever Devil Dog Breed Figurine was the perfect representation of her. I keep a Yellow Labrador Retriever Devil Dog Breed Figurine on my desk at work. My parents have a Lhasa Apso named Killer. Killer is basically a good dog with some annoying habits. He likes to take food out of his bowl and take it into another room to eat. Every once in a while, my parents step on a piece of food which had been dropped in the hallway. I’m sure that when they say, “Ouch!”, they are actually thinking, “You little devil!” They now have a Lhasa Apso Devil Dog Breed Figurine on their curio shelf at home. Although sometimes we call our dogs “brats” or “little devils” we say it out of love. And sometimes when we think back on bad things they have done, we can’t help but to laugh. Get a Devil Dog Breed Figurine to help remind you of those times. Visit the Animal Figurine Store.com and enter “devil” in the search field to pull up all our Devil Dog Breed Figurine gifts. See if we have a Devil Dog Breed Figurine for your dog’s breed. Thank you for everything that you do for me. For taking me for walks so I can mark every tree. Thank you for sneaking me your dinner scraps when mom isn’t looking. For letting me taste some of your barbecued cooking. Thank you for playing fetch with me and taking me to the park. For not being too mad at me when I bark. Thank you for letting me on the couch when mom isn’t home. For giving me treats and sometimes a bone. Thank you for rubbing my belly and scratching me behind the ears. For soothing me during thunderstorms to calm my fears. Thank you for giving me a challenge when we play tug-of-war. For playing with me until I am too tired to want more. Thank you for being patient with me when I have been bad. For letting me put my head on your lap you when you are sad. Thank you for the nice warm bed and the loving home. It’s for you that I wrote this little poem. Thank you for being such a wonderful Father to me. I will make sure you have Happy Father’s Day, you’ll see. Happy Father’s Day!! – from your best friend. We have recently updated our www.Animal Figurine Store.com website. We have updated it to mostly sell dog and cat figurines. Our wildlife figurines are being faded out and are all currently on sale for a very low price. Dog figurines can be found by searching under the AKC breed group or by entering your dog’s breed in the search field. We will be adding more dog and cat figurines over the next couple of weeks so if you don’t see a dog or cat figurine you like, come back and visit us again! My dog, Sephi is very leash-reactive when it comes to other dogs. What does leash-reactive mean? It means that when we are going for a walk, Sephi barks and lunges at other dogs she sees on the way. This is very problematic as she has taught my other dog, Maya, to do it too. So whenever I take them for a walk, I have to try to control two big dogs when we see another dog. It is not at all easy. And the situation could be very bad if either of them gets away from me. Due to this issue, I usually only take them on walks during the times of day when fewer people and their dogs are out. And if I see another dog, I try to walk as far away from them as possible before Sephi and Maya see them too. But this is only one solution to the problem. To try to find other remedies, I purchased a book titled, Feisty Fido, Help For the Leash-Reactive Dog, by Patricia B. McConnell, Ph.D. and Karen B. London, Ph.D. The book has been very informative and helpful. I must warn you, however, that the process is a long one. There is no immediate miracle cure and it takes a lot of time, patience, positive reinforcement, and consistency. 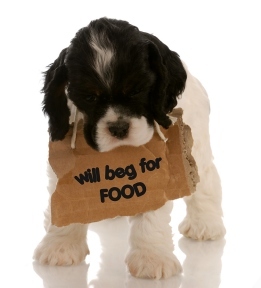 (See our post, https://americandogblog.wordpress.com/2010/04/19/fundamental-dog-training-tips-lots-of-tppc/) But it is worth it and it works. The first tip they taught is called the “Watch”. This cue works just like it sounds. You teach your dog to look at and focus on you. You start in areas with no distractions and tell your dog to watch. When they look at you, give them praise, a treat, or whatever reward motivates your dog to learn. As you prefect this cue in non-distracting areas, slowly introduce mild distractions and work your way up to bigger distractions. Over time, your dog will learn that whenever they see another dog, it is better to watch you than to pay attention to them. The second tip they teach is the “U-Turn”. This cue also works just like it sounds. Whenever you see another dog, turn and go the other way. The trick to this cue is to encourage your dog to follow you without having to jerk on their leash. Leash jerking can make the leash-reactive problem worse rather than better. Again, you have to start this cue with no distractions and work your way up to higher levels of distractions. We have given a very simple overview of two of the tips indicated in “Feisty Fido”. We highly recommend reading the book for more important details and additional tips. Visit the author’s website at http://www.patriciamcconnell.com/product/the-feisty-fido for more information and other great books. 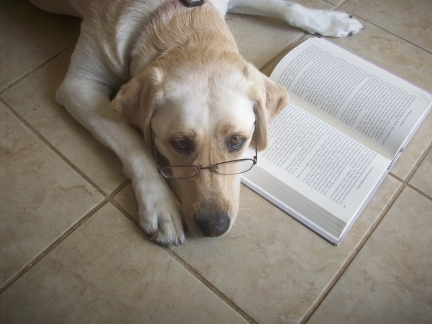 The book is also available at our Amazon.com affiliate site titled Dog Lover’s Book Store. Dogs can get fleas and/or ticks any time of year. But spring and summer months are when these pests are most abundant. This makes it harder to keep your pet pest free. Check out this great post on the AllThingsDogBlog titled, Top 5 Tips for Fighting Fleas and Ticks. Here is a great article from Paw Nation about the Great Dane Dog breed – 10 Things You Should Know Before Getting Your Own “Marmaduke”. This dog breed is sure to become popular now that the new movie, Marmaduke, is coming out. If you are still considering getting a Great Dane dog breed after reading this article, also consider where you get him from. There are going to be several unscrupulous dog breeders out there taking advantage of this opportunity. They are going to breed dogs without care or concern about any genetic health traits they may be passing on. 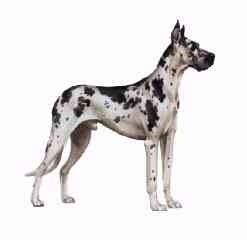 Great Danes are prone to gastric torsion, hip and elbow dysplasia, cariomyopathy, and bone cancer. If you want to get your own Marmaduke Great Dane dog breed, consider adopting one from a Great Dane rescue group. The dogs may already be trained and any health issues may be known in advance. Or if you purchase from a breeder, do your research and make sure they are a reputable Great Dane dog breeder. A reputable breeder will not only be a member of the American Kennel Club, but they will also likely be a memeber of a breed club such as the Great Dane Club of America, Inc. This is too cute! Check out this adorable video of dogs surfing. Notice the dog with a life jacket that reads, “SurFur”. And look at how much fun many of these dogs seem to be having.